The election tamasha that was successfully taken online by the BJP during the 2014 general elections is playing out in a bigger avatar, reports Sanjay Jog. For the Brihanmumbai Municipal Corporation elections, the Bharatiya Janata Party built an app 'Invite CM' that let Devendra Fadnavis engage with voters. Fadnavis was also active on Twitter. Several followers made short films with the lion as a party mascot swatting down a corrupt tiger (a symbol of ally turned foe, Shiv Sena) and shared them via Facebook and WhatsApp. In Uttarakhand, Congress Chief Minister Harish Rawat has a WhatsApp group: 'Uttarakhand rahe khushhaal, Rawat sarkar poore panch saal' (For a prosperous Uttarakhand, give Rawat a full five-year term) that reaches voters in multiples of thousands, the party says. Rahul Gandhi's campaigns are being streamed live on the party’s Facebook page while another page labeled Janvedna Sammelan records the problems faced by demonetisation. The election tamasha that was successfully taken online by the BJP during the 2014 general elections is playing out in a bigger avatar. Every political party and its army of official and unofficial followers, is part of the blitzkrieg -- be it the local municipal polls in Mumbai or the assembly elections in Uttar Pradesh or Punjab. "We have a database of five million online users, which has come quite handy," notes Shweta Shalini, spokesperson for the BJP. Rajiv Dingra, founder and CEO, WATConsult, part of the Dentsu Aegis Network says, "In metropolitan areas the social media is no more a niche but a mass medium of communication." Meet Maharashtra's richest politician ever! The BJP is the master of the medium say political observers. In Maharashtra, Fadnavis has been responding to complaints and suggestions and sharing his schedules and views on Twitter. Last week, he found himself in a bit of a spot at a rally in Pune where hardly any people turned up. Rivals mocked his planners saying no one organised a rally in Shaniwar Peth in the afternoon, siesta time for residents of the area. Fadnavis took to Twitter. “I have cancelled my public meeting at Pune due to miscommunication of time of rally. I regret for the same. Heading towards Pimpri Chinchwad,” he posted. While many had a good laugh at his expense, retweeting with caustic asides, many gave him points for clearing the air. Twitter is the preferred medium according to the spokespersons of all parties. It is more effective than a short film listing the candidate/party achievements or exposing the failures of rivals, they said. Facebook is popular too, as is WhatsApp. A few are also on Instagram. “In a city like Mumbai there are 12-14 million internet users and social media is the cheapest, fastest and most effective way to reach out,” says Dingra. 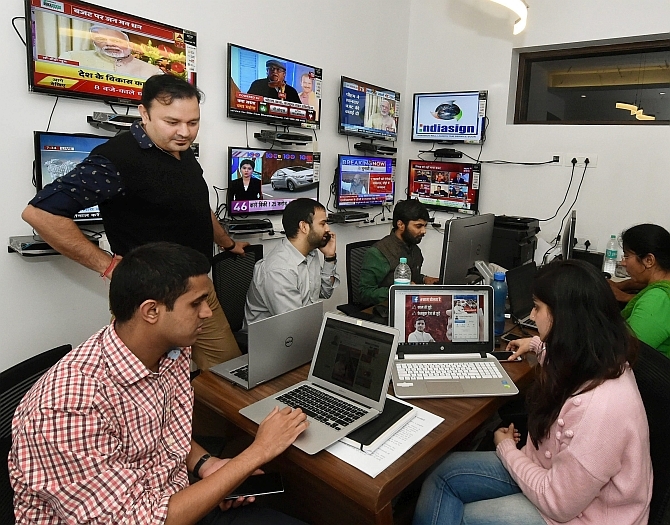 Every party has set up war rooms managed by young party workers who keep up a constant barrage of tweets, comments and posts. They are inexhaustible in the hunt for likes and shares. For example, on a single day (Sunday, February 12) during the BMC campaign in Mumbai, 20,000 tweets, 10,000 Facebook posts and 500-odd video clips were uploaded. Dingra believes that political parties are still amateurs when it comes to social media. "It is largely being used by the candidates and parties on why to vote for them and is not being used intelligently to create a common thought process and viewpoint via community building. The social media platform can certainly be used to build up opinion as done in the western countries," he says. For the moment, parties are happy to use online media to expand their flock of followers. The Congress has created a WhatsApp group, down to the booth level in Punjab, Uttarakhand and large parts of Uttar Pradesh. This and other social media initiatives are being overseen by Prashant Kishor, who has pitched in with slogans and logistics support. In Punjab, websites like “Punjab da Captain” (captain of Punjab) for Amarinder Singh have been launched. Around one million people registered for the campaign through their mobile phones, the party said. The Samajwadi Party in UP is pushing video campaigns like “Kaam bolta hai” (work speaks) through social media. It also has a special team of workers calling up thousands of voters every day to know what the burning problems of their areas are. For the BJP in Maharashtra, its tag line is ‘Transparency in Transformation’ while Shiv Sena is running a '#didyouknow' handle. The NCP has a counter campaign saying #You Should Know that seeks to expose its rivals’ lies. “With social media soldiers at 12,000 booths, 227 wards, mandals and district level, the BJP is using the transparency plank,’’ says Shalini. The Shiv Sena has 150 yuva sainiks managing the Twitter handles. Uddhav Thackeray’s public relations in charge Harshal Pradhan informs that the party has 850 WhatsApp groups with at least 265 members each that continuously update speeches, press briefings and video clips. “The Shiv Sena has focused on listing out its achievements and simultaneously exposed scams and corruption and the campaign is created in-house,’’ says Pradhan. The #Congress for Mumbai has about seven million followers the party says. “Moreover, Mumbai Regional Congress Committee president Sanjay Nirupam’s handle has a reach of 1,30,000,” says social media head Hiren Joshi. Shweta says that the BJP does not use social media for mud-slinging or running vilification campaigns. Other parties echo the same sentiments. But ask them about offensive cartoons and films doing the rounds as jokes and forwards and they quickly sidestep the issue. The parties blame the armies of unofficial fans and followers in the digital world, who they say, they have no control over. IMAGE: Samajwadi Party President Akhilesh Yadav's war room setup at Janeshwar Mishra Trust office to handle his election campaign for the Uttar Pradesh assembly polls, in Lucknow. Photograph: Nand Kumar/PTI Photo. Is Shiv Sena changing the goalposts again?